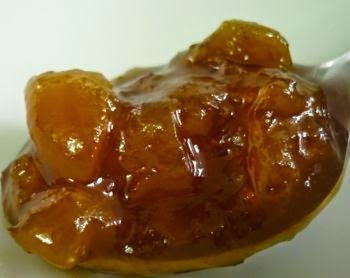 Sweet and savory kounry fresh apricots chutney with onions taste so good on pork and chicken and plus good as a side dish for spreading on foods..go wild and have some fun with chutney. Heat the oil in a skillet over medium-low heat. Add the onions,salt and cook until soft and translucent. add the garlic and cook about 1 minute. Stir in the bourbon and cook 2 minute. Stir in half of the apricots, the honey, mustard and vinegar. Cook until the apricots start to soften, about (30 seconds depending on the ripeness of the apricots). Remove the skillet from the heat and allow chutney to cool. Stir in the remaining apricots. Season with more salt, if needed. Serve warm or at room temperature. Refrigerate the leftovers in a covered container.